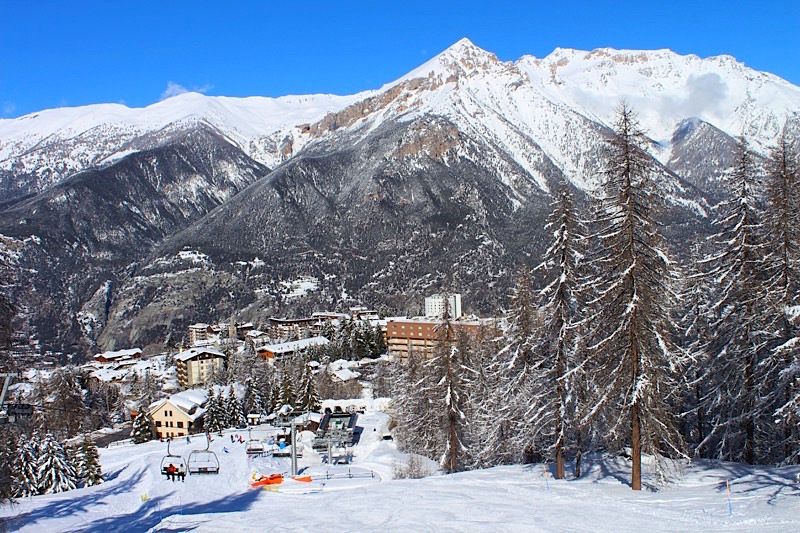 Situated at one end of the Via Lattea (Milky Way), Sauze d’Oulx is one of the larger, more popular, resorts of the area. With access to the Via Lattea’s 212 pistes there is excellent skiing available for all abilities. Sauze provides mainly intermediate runs and is a red run paradise. The resort is nestled amongst larch tree forests and many of the best runs wind through the trees back to the village. Sportinia is a mid resort located just above Sauze d’Oulx at over 2000mt. All the runs from here are tree lined whilst above Sportinia it opens up and provides the links to the rest of the Milky Way. For advanced skiers there is easy connection to Sestriere and the black runs at the top of Mount Motta, Mount Sises and the Olympic Kandahar Slalom and Kandahar Barchetta runs. Nearer to home their is some challenging skiing off the top of Fraiteve (2690mts) with much of the northern face offering some great off piste. If you like to venture off the beaten track then Sauze also offers some great off piste through the trees. As with most resorts the best off piste is locked away in the minds of locals however there are guides available to help you find the best runs. Beginners are well catered for too as Sauze d’Oulx has excellent English-speaking ski and snowboard schools that will get you up and skiing, or boarding, in no time at all. Sauze d’Oulx has a much better than average sunshine record and much above average skiing. The vast majority of the pistes in Sauze d’Oulx have artificial snow-making facilities which is true throughout the Milky Way. When the day has finished the town offers as much or as little apres as you like. There are plenty of bars to choose from offering you everything from sophisticated cocktails and excellent local wines to pints of Guinness. This being Italy the standard of restaurants is high. Sauze d’Oulx is not just a winter resort. It’s a fantastic place to visit during the summer months too. Mountain biking, walking, golf, road cycling are all on offer or simply use Sauze as your base to go off and explore Turin and the Susa Valley. The mountains offer a completely different experience during summer and it’s well worth considering. For more information take a look at the summer page. The map below indicates the locations of the businesses that are mentioned on this website. Click on the side bar icon located in the left corner of the title bar to see them listed by category and by name.